A puppy starts his life with no knowledge of knowing whether it is right or wrong to eliminate in the house. Accidents inevitably are going to happen, but with a great deal of patience, a consistent and fool-proof training plan (and a great floor cleaner! 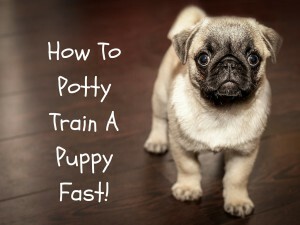 ), you will be on your way to understanding how to potty train your puppy fast! Is The Crate Training Method Effective? What Size Crate Do I Need For My Puppy? You should purchase a crate that is large enough for your puppy to fully stand up and turn around in, and also be able to stretch out when laying down. Although he shouldn’t feel cramped in any way, be sure not to get a crate that is too large as your puppy may begin to develop a bad habit of going to the bathroom in one end, and using the other end to remove himself from his mess. A crate of the perfect size is an important component of the training process. If your puppy will grow into a large sized dog, you can buy a large crate, but one that comes equipped with a divider panel allowing you to adjust the living space as your puppy grows. Daily Training Routine – Sticking To A Consistent Schedule! As a means to developing a happy, healthy puppy you should spend adequate amounts of time socializing and playing with him. But, when you are busy doing other things, your puppy should be placed in his crate. Decide on a feeding schedule and stick to the same times each day. Puppies are like children in the way that they do much better with a consistent routine. As the day winds down to an end, remember to pick up your puppy’s water bowl well in advance of bedtime. This will help to prevent those middle of the night accidents. In the beginning, you should take your puppy outside once every hour. It may seem excessive, but the less accidents your puppy has in the house, the quicker he will understand the concept of outside elimination. Always take your puppy outside first thing in the morning (I know it’s tough prior to morning coffee! ), last thing before bed, and after each meal. Bring your puppy outside to the same spot each time, this will help him to relate that spot with being the place to go potty. Give him a verbal command such as, “go potty” (or whatever you decide). Eventually he will get used to those words and will understand what you are asking him to do. Remain close to your puppy when letting him out so that you can offer lots of praise once he goes potty. Dogs have an interest in pleasing us, so much praise can go a long way in getting him to repeat his actions for next time! Most pups are highly food driven, so you can also offer a treat to reward your puppy. If your puppy does not go potty when you let him out that is fine, but be sure to place him in his crate when you bring him back inside. This is not to punish him, only to ensure he doesn’t have an accident in the house. Be sure to bring him back outside to try again after 15 or 20 minutes. Once a puppy does his business outside, it is the perfect time to allow him to roam around the house and get a little play and socializing time in. This is the one time you can be certain your little fur child won’t be making messes, and it’s a great reward for a job well done! What Do I Do When My Puppy Has An Accident In The House? Puppies, or full grown adult dogs for that matter, never eliminate in the house as a way to be intentionally naughty, or get back at us for something. Their brains just don’t work that way. So, if you are feeling frustrated please remember that, and know that they WILL come to understand what is expected of them eventually. It is inevitable that your puppy will have some accidents in the house. When this occurs you should not spank, yell, or rub your puppy’s nose in his mess. If you are lucky enough to catch him in the act, the most effective approach is to give a firm, “no!”, and immediately bring your puppy outside. Once outside complete your usual routine of giving him the “go potty” command. Even though you know he probably won’t go (he already made that clear by the indoor puddle on your floor) you should still bring him outside in order to establish the connection of eliminating to his spot outside, and not indoors. 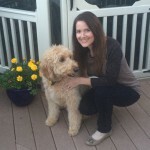 Do not punish your puppy for messes that are found after the fact, it’s simply not effective, and your puppy will not understand or make the connection with what you are trying to convey. It is important to remember that all puppies learn at a different pace, so don’t be frustrated if your neighbors puppy became housetrained fairly quickly while you’re still pining away at the training process many weeks beyond. As long as you are patient and remain consistent in following the potty training process eventually, though at times it may feel like a lifetime, your puppy will learn too! Sticking to a schedule and using a crate are so helpful, it’s the best way to prevent accidents.